For 1976 this is pretty much as hard as a group soul record got. Lead singer Fred Ross wrote this one for the San Francisco group he was fronting at the time and he put his heart into singing it as well. An atmospheric ballad packing a big gritty punch I Only Wanted To Love You has the feel of Sam Dees’ contemporary work. Love Fred’s falsetto squeals. After big local reaction 20th Century picked it up and took it into the national charts to #88 early the following year. Not often you read about a national hit on this website. 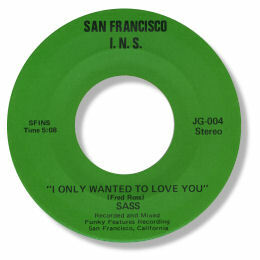 I’ve not been able to find a follow-up single from Sass. Note ~ Fred Ross’ website can be found here. Thanks to my friend John Lias for tipping me onto this one and to Dante Carfagno for extra info.